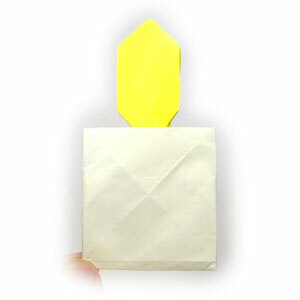 This page is for those who want the instruction to fold a 2D origami candle. This origami candle is a 2D model. You will start from a 4x4 matrix base. One difficulty in this model is you need to apply a crease pattern to make a candle light. You may use any kind of paper to fold this origami candle. 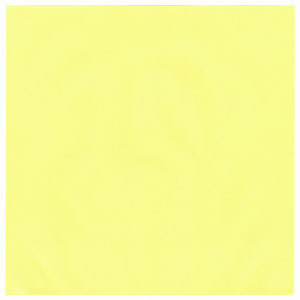 I am using a typical single sided yellow color origami paper here. 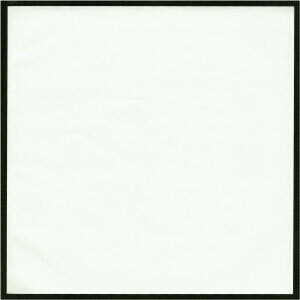 The dimension of the paper is a square of 15cm x 15cm. It is a good size for those who are not experienced in paper folding. If you are become familiar with this model. Then you can try smaller size paper. It's a paper with white color only. The black background is being used to show the paper boundary.